My translations are almost always perfct: (Subbed) I want to eat my shoes! (Subbed) I want to eat my shoes! Here's another video from the variety show 探偵ナイトスクープ or "Knight Scoop." 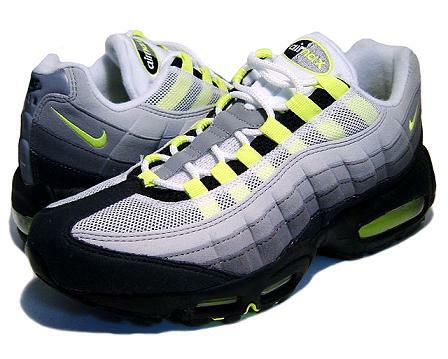 In 1995, Nike released a shoe called "Air Max 95" in Japan. And for reasons I can't remember, these shoes became so popular that the high demand drove up the shoe's price to an unprecedented level (I've heard anywhere from $600 to upwards of $2,000). エアマックス狩り, or "Air Max Hunting", where they targeted someone wearing the shoes, beat them up, and snatched their coveted Air Max 95's for a profit. Thankfully, the phenomenon of beating up people for expensive shoes has pretty much disappeared in Japan, the reason being that shoes don't have the crazy mark up values that were seen in the mid-90's. The Yugioh manga has a chapter which may well have referenced the Air Max Hunting you described. Interesting. Hey just wondering when the subbed version of this year's "no laughing" show will be uploaded? When you pay him the working hours, jerkface. He isn't doing them. It's zurui who is subbing it this year. Google it. There was a popular manga-turned anime-turned tv drama-turned movie+specials (regular japanese franchise, in other words) called Great Teacher Onizuka (I'm sure you've read/seen/heard of it), and in the first chapter there's some 不良 guys hanging outside an arcade trying to extort money out of people by having them buy Air Max shoes for them. When the cops come in later, they use a term I can't remember but it alluded to AirMax Extortion and crimes involving Air Max shoes were a frequent thing. Aaaand now I feel dumb. Just reread your post now that it's expanded and saw where you wrote about it yourself already. And lol, yeah as soon as I heard Air Max, I thought of that. Ap, I'm sure he wasn't being insulting; don't be a jerkface yourself.